We’re about two weeks away from the YMA’s so it’s the perfect time to highlight some books that are flying under the awards radar. Both of the titles I’m looking at today have excellent character writing and deal with themes of violence and what people do in extreme circumstances. Neither book quite has what it takes for the Printz, but I was surprised that they didn’t show up on more best of the year lists. Thankfully, both are BFYA nominees so while I keep my fingers crossed, read on for why I think they deserve some kind of recognition. Chasing Shadows begins with a horrific act of violence, but it’s not presented with words. We are shown a gun in closeup, a bullet rips across panels as the novel suddenly switches format, becoming a graphic novel. The transition is seamless; Avasthi sets it up by breaking down Holly’s thoughts: “Time sl-o-o-ws. Sounds stop as my brain captures images, frame by frame.” For Holly–whose twin, Corey, is the victim of the shooting we see–large portions of the sections from her perspective are presented in graphic format, which is appropriate for a comic book lover as she descends into mad grief. Craig Phillips’ artwork perfectly captures Holly’s psyche. Like her favorite comic book hero, The Leopardess, Holly wants to steel herself against the world, physically and emotionally. When she is represented in graphic format, it’s clear that in her own mind, Holly is fighting against external evil forces, although it’s left ambiguous if the Shadowlands are real or just a delusion. They are very much real to Holly, and that’s what matters in her story. The other narrator is Savitri; Holly’s best friend and Corey’s girlfriend. Prior to Corey’s murder, the three teens are at a pivotal moment in their lives. Once their final decisions had been made about college, these three would have been dealing with major emotional fallout. After Corey’s death, Savitri feels an especially deep obligation to support Holly even when her behavior becomes erratic. The situation is unfathomably awful, but Avasthi’s deep focus on the inner lives of each girl makes the novel believable. Even when their actions stretched my suspension of disbelief, I always believed in the emotional motivation behind every choice. It’s not just the narrative style and rich characterization that makes this book special; it’s because it’s one of the best books about friendship that I’ve ever read. Even though this is a relationship in extreme circumstances, it is nonetheless a portrait of two girls who are moving in different directions, and how difficult it is for two people to maintain a bond when they want very different things. Although it hasn’t generated any Printz buzz, this is one of my favorite books of 2013 and definitely worth checking out. Horror is such a tricky genre to assess. Fear is a subjective emotion. Example: The Waking Dark did not scare me. I thought it was disturbing for sure, but I wasn’t frightened. (Lest you think I have nerves of steel, I’d like to point out that the inspiration for this book, Stephen King’s It scares the bejesus out of me; in fact, I’ve had to skip large parts of it because I was so scared while reading.) But just because the book didn’t scare me doesn’t diminish its quality as a first-rate horror novel. The first chapter alone is a kind of microcosm of the entire book: intense, gory, and written from multiple perspectives. But this novel is more than just an extreme thriller. Wasserman uses the intensity of an extraordinary situation–an entire town under a mysterious quarantine after a devastating tornado–to work out themes of morality, choice, and identity. And it’s an apt setting because growing up can feel intense and suffocating, and at times it can seem like you are working against forces much bigger than yourself. Wasserman explores the disintegration of one small town to magnify the incredible obstacles one faces as a teen. The world is literally against these kids. The five main teen protagonists represent different kinds of coming-of-age crises one can face: accepting your sexual identity, figuring out who you are as an individual outside of your family, deciding if you can transcend society’s perception of who you are, and acknowledging strength you didn’t know you had. The exploration of these ideas is what I loved about this book, even if they are somewhat overshadowed in the last third of the novel when the mystery of the quarantine takes precedence. Not all of the teens survive to the end of the novel, but not everyone survives adolescence. Sometimes a stifling environment swallows young people up. 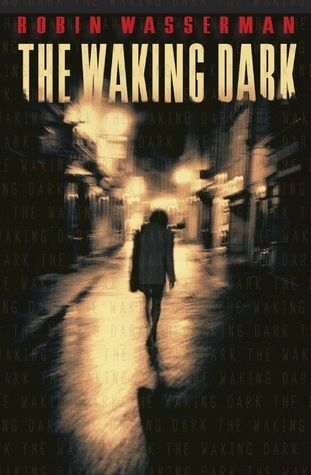 The Waking Dark is hardly a perfect novel–pacing being its major issues–but it effectively uses setting as metaphor and offers some big ideas for readers to chew on played out by interesting characters. It may not be Printz-worthy, but it certainly makes my personal list of favorites. I don’t have anything particularly thoughtful to add, since I agree with both of your reviews, but I did want to say I think your comment about the FRIENDSHIP in Chasing Shadows is on point and what made that book such a knock out read for me (even if it’s maybe not a Serious Printz). That’s definitely the theme that kept resonating in my head since I first read it. Avasthi just hits all the right emotional notes. The biggest flaw to me was the plot, which really stretched believability in a book that was really grounded (even with Holly’s interactions in the underworld). The entire hunt for Corey’s killer just seemed too much like the kind of thing that would only happen in fiction. Otherwise, this is one of only a few books that has really stuck with me this year. 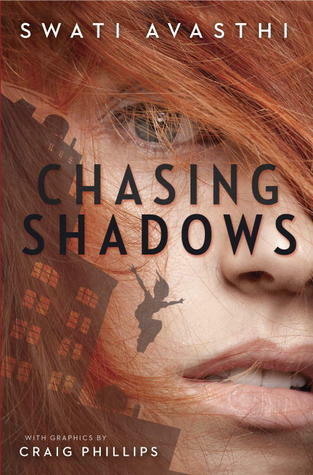 Joy, I am so pleased to see you mention Chasing Shadows. I am working on my review of it now. It is a dark horse Printz candidate for me. I think it IS Printz worthy and heaven knows that we have chosen other Printz books that are not as good as this one! I wish I had more time! I loved — adored — Chasing Shadows. The depiction of friendship, the graphic sections (which never detracted from the main text or felt unnecessary, and added another layer to the rich story), the use of mythology and freerunning. Savitri’s choice at the end, where she chooses to move on and start her own life, to make her own choices and not be dependent on someone else, was also fantastic and solidified this book as a great one for me. This book is a dark horse, and though it’s received virtually no Printz buzz/recognition, it’s fantastic and (deserving of a Printz. If the committee agrees with me, I’ll be thrilled. Otherwise, I’ll continue recommending this novel (and SPLIT) to my friends. Just wanted to say that The Waking Dark creeped me out so badly that I had to put it down only about 1/3 through — and had bad dreams for a day or two after. So while it has flaws, I certainly found it very effectively written to evoke horror!